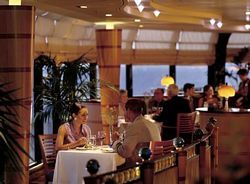 Disney's signature restaurant at sea, treats adults to sweeping ocean views and northern Italian specialties. Located high atop both ships, it's the perfect setting for romantic dinners and intimate gatherings. During sea days (certain cruises only), Palo hosts a spectacular champagne brunch and a traditional high tea. Due to its popularity, reservations are required at all times. Reservations can be made in advance on once onboard. Palo is very popular and gets booked up quickly. A romantic setting in an elegnat, candlelit setting. Dine on Nothern Italian specialties and be sure to save room for one of the exquisite desserts. A gourmet feast which includes a glass of champagne. Featuring an extensive array of foods, part buffet, part made to order. Choose from a selection of cheeses, fresh fruit, breads, pastries, seafood, meats, caviar, and decadent desserts. Served only on days at sea. High tea on the high seas. Dine on cakes with a fine selection of teas, in a wonderful atmosphere. Deck 10 on the Disney Wonder and Disney Magic. Dinner: nightly at 6:00pm, final reservation time is 9:00pm. Brunch: 10:30am-noon; During visits to Key West, brunch is served from 10:00am-11:30am. Dinner: Dress shirt or jacket required for men; a dress or pantsuit for women. Brunch: Cruise casual, no shorts, swimwear or tank tops. Enjoy the atmosphere of Palo without booking a meal, just stop by the bar for a drink in the evenings. Don't miss the famous chocolate souffle at dinner! You don't have to eat a full meal at Palo, you could eat dinner at your regular restaurant on first seating, then book Palo just for dessert ($15 charge still applies). If you make your reservation online before boarding, then once you board find out it clashes with a rotation restaurant you didn't want to miss, you can change the reservation, or your rotation by attending the dining changes / Palo reservation meeting.